Posted on Jul 24, 2015 by Appleton Downtown Inc.
Wisconsin Hickory Syrup, LLC is a new vendor this year at the Saturday morning Farmer’s Market in Downtown Appleton. They sell both hickory syrup and nuts. I, like most of you I’m sure, have never tried either. The nuts are really good. It’s like walnuts and pecans had a baby and called it hickory. They look vaguely like pecans and taste closer to walnuts. 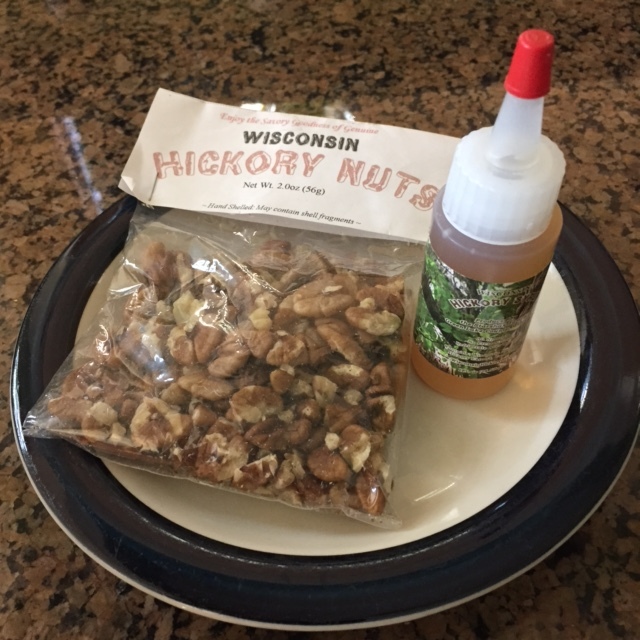 The owner, Michael Starshak, explained that hickory nuts are extremely difficult to crack and is partly why most people have never tried them. Native Americans have prized the nuts for centuries and apparently know how to hit the shell just right to get it opened without shattering the nut. Michael is a better story teller than me, so make sure you stop by his booth to get the full explanation. The syrup is great! It might be the novelty, but I think I liked it even more than maple syrup. It is similar to it’s cousin, but perhaps a touch less sweet. I ended up putting some of the nuts and syrup on a waffle. Spruced up my breakfast very nicely!